It could be the perfect time to be playing Manchester United, according to Clarets midfielder Jack Cork. With all the whispers of discontent coming out of Old Trafford, reported unrest between Jose Mourinho and a vintage collection of his squad, and successive defeats in the Premier League, the England international believes this fixture couldn’t have come at a better time. While the Red Devils shipped three goals against Brighton and Spurs on Bank Holiday Monday, Burnley have been stuck in a rut themselves, conceding goals freely and failing to win in the top flight since April. However, Cork is confident of turning things around and emulating the club’s form against the top six last season. 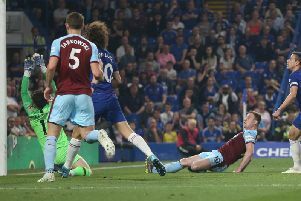 Sean Dyche’s side took points from champions Manchester City, Spurs, Liverpool, Chelsea and United, with Arsenal the only European qualifiers to avoid defeat. “There’s a bit of noise coming out from there, some bad things, but it’s still Manchester United and they’re a massive team,” said Cork. “They’re one of the biggest teams in the country, they’re always there or thereabouts towards the end of the season so no matter what is being said in their camp won’t be too bad because it’s still Man United. With the chance to go up against World Cup winner Paul Pogba once again, as well as Brazilian pair Fred and Andreas Pereira, the 29-year-old added: “We’ve had some great matches already this season in the Europa League. “All the games have been brilliant, and it’s always nice to play a team like United and play against the players that have done well in the World Cup. It’s good to see how we can do against them. It’s brilliant. “We’ve got a good record against the top six and we had some good games against them last season. We want to carry that on. Meanwhile, Cork doesn’t agree with claims that the club’s involvement in the Europa League has hindered their league form. Consistency was key for the Clarets last term, with little change in personnel, but their schedule has made a squad rotation policy a necessity, with partnerships chopping and changing. “You need to keep making the changes,” he said. “It’s difficult so it has been good having that squad rotation to deal with it.